The Fragile X Files: How did you get here, Mrs. Rogers? How did you get here, Mrs. Rogers? 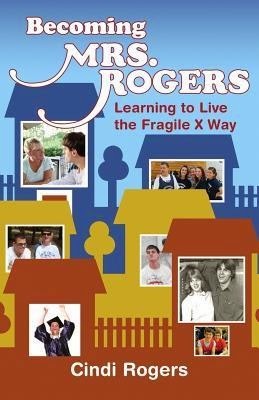 Like it's namesake, Mrs. Rogers Neighborhood is a place where things run smoothly and by a comfortingly predictable routine, which makes life manageable for two boys living with all the challenges Fragile X can toss their way. Meticulous schedules. Remodeling and additions to their home. Vacationing in "Rocket," their RV, so they can basically bring the comforts of home everywhere they go. I don't think she's ever seen a problem she didn't stare down and beat into submission. She is so together. She is so self assured. How did she get to be like that? Presuming she started out a total wreck like the rest of us. How the heck did she get there? I can't wait to read her new book, in the hopes that these questions will finally be answered! Cindi is a real role model for me, not just as a mother to children with Fragile X but as a speaker and educator, and now an author! I was green with envy when I saw that she had a book out - but quickly realized, mine isn't ready because our story isn't finished. I'm still in the thick of it. Check out Cindi's story, available on Amazon! I plan to bring mine along to the conference in Anaheim this summer, so I can ask her to sign it.